You’re going somewhere new, meeting someone you’ve not met before and you are going to be getting in and out of plenty of clothes, so it’s important to feel comfortable in your surroundings. I was greeted with a selection of pastries and drinks and introduced to my Personal Stylist, the very lovely Kristy who welcomed me in to the luxurious styling studio. 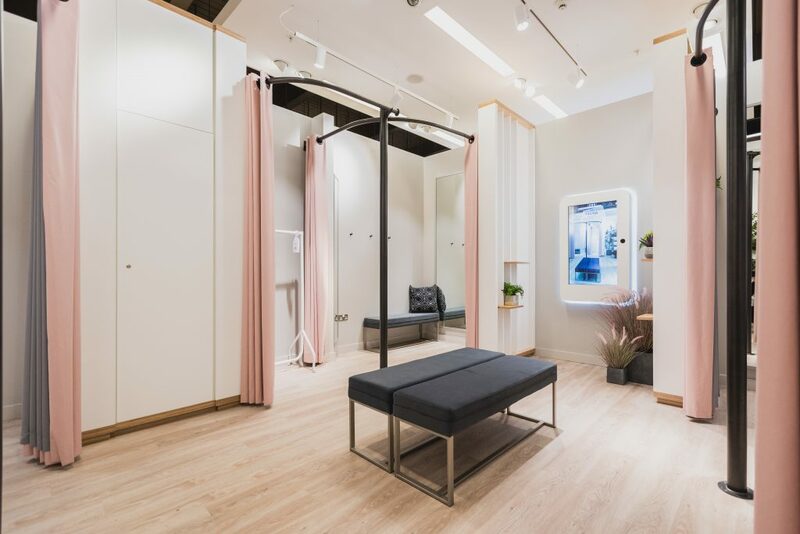 The dusky pink and grey surroundings with some greenery for good measure feel stylish and soothing with comfy seating area to meet your stylist then we head through to a fitting room, three of which are positioned around the focal point of a digital Delay Mirror which enables you to see your outfit on you at 360 degrees. My stylist, Kristy, had carefully curated a rail of garments based on the information I’d given her in my client form (completed when booking the session online); items which she knew would be within my comfort zone (skinny jeans, heels and skirts) but with key trend updates for the new season. There were also some items which would encourage me to try new shapes and styles that Kristy felt would work for me. I always think the first pieces a stylist picks out for you should ease you in to the experience and you should see items you are comfortable with, some that fit the bill of what you’re looking for and some pieces you wouldn’t have chosen yourself but when you try them, they work! And perhaps a wild card or two thrown in there which your stylist feels would be great for you. Kristy ticked all these boxes and more. 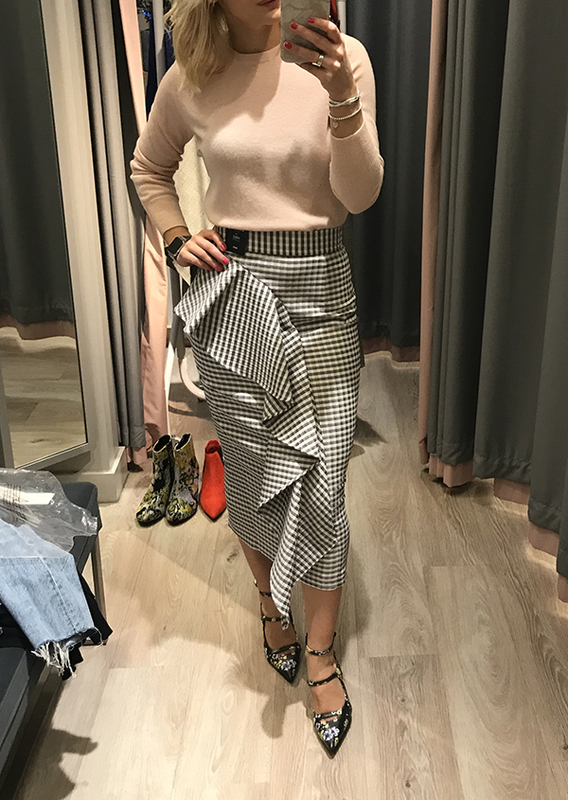 Kristy suggested which pieces to try together and gave great advice one what to tuck and untuck – something that makes all the difference to how an outfit looks; it’s those finishing touches which can enhance the shape or style of an item and the overall look. When a stylist knows the stock, it makes your shopping experience speedier and more successful. As we went through the session Kristy listened to everything I said; I loved the first pink sweater but wool makes me itch (I hadn’t mentioned this) so within a couple of minutes she was back with similar options, minus the wool. She knew the stock in store and how it fits the body well enough to know when to size up or down in some items compared with the sizes I gave her on my client form. 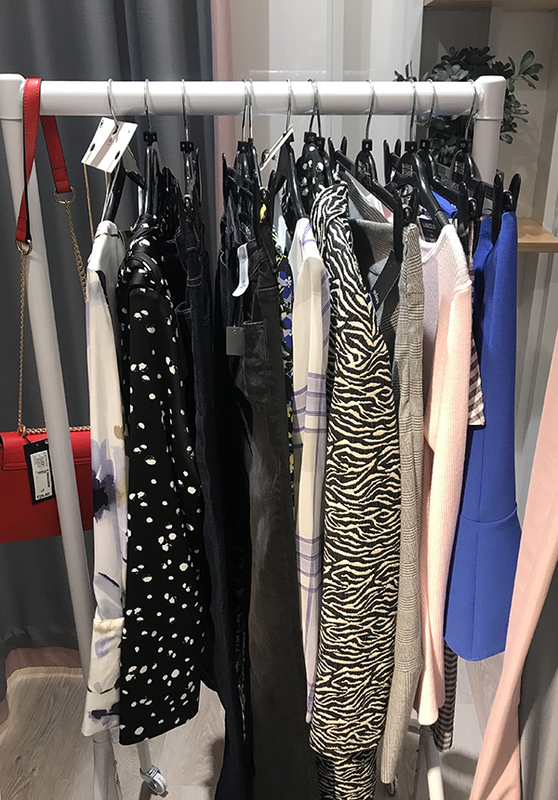 When a stylist knows the stock, it makes your shopping experience speedier and more successful, which is surely what we all want when we’ve got a small window in our day to shop. 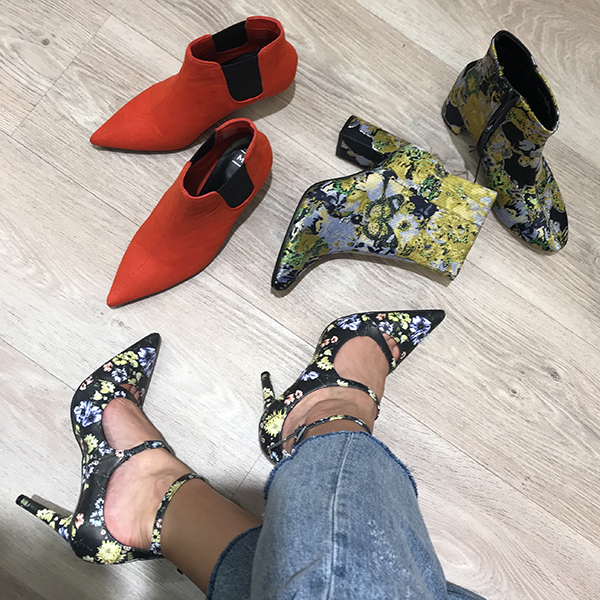 I loved one pair of red boots but I found the kitten heel too low – I can do skyscraper heels or trainers but just couldn’t walk properly in the kitten heels! – so Kristy found an alternative red boot with a higher block heel right away. 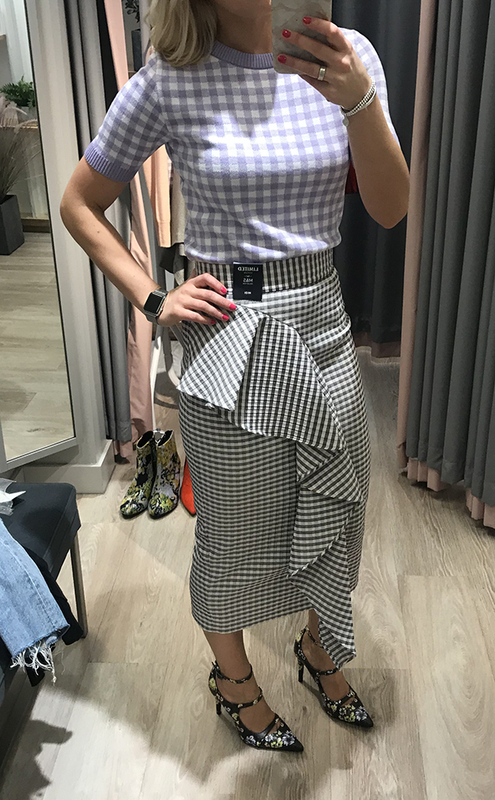 The checked asymmetric skirt (above) was great but didn’t fit on my waist, so Kristy suggested the in-house alterations as an option if I really wanted this skirt as there wasn’t a smaller size. Time really does fly when you’re in the fitting room – for the stylist and the client! – but I didn’t feel rushed as Kristy gave me time to choose the pieces I wanted to take home from my shortlist. It’s important to take a few minutes to decide and ask yourself at the very least: do I need it, do I already have something like this, what else can I wear it with? I went for three pieces which could be worn together as one full outfit, but also each will work well with endless other options in my existing wardrobe and serve multiple occasions. Adds colour to any outfit. 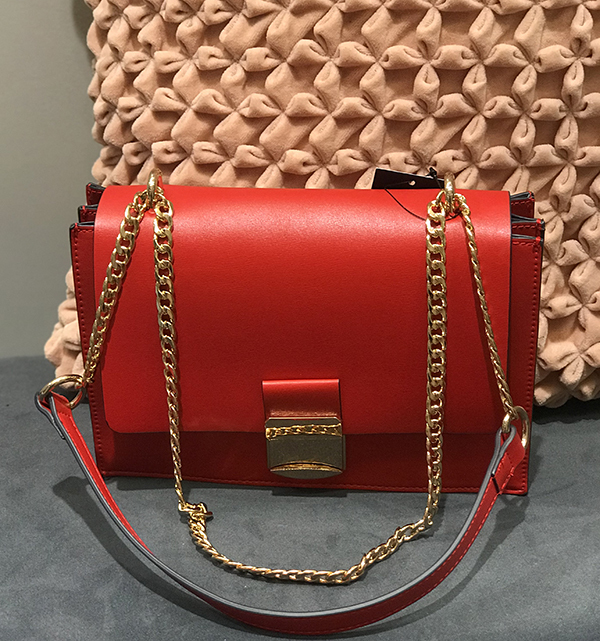 Can be worn cross body, over the shoulder or with strap doubled up Chanel-style as handbag. Useful size from school run to evening out. Shirt dresses are eternally useful items in your wardrobe all year round. Wear alone with heels or with trainers or layer with a top or roll neck beneath. Remove the fabric belt and swap with a brightly coloured or printed (yes, I’m thinking leopard!) belt. 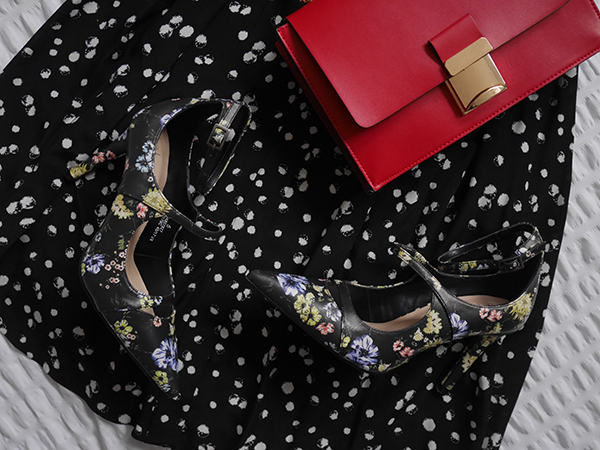 Admittedly, I own a lot of shoes, most of which are heels, but I do not own a floral pair. Can you believe it?! These make a great alternative to my go-to leopard heels to add pattern to an outfit. Not only are these great with dresses and skirts, they also worked well with the wide leg cropped jeans I was wearing when I arrived to my appointment. The multi-strap design ensures the foot is held in place and with a more modest heel than I usually choose these are a wearable heel. 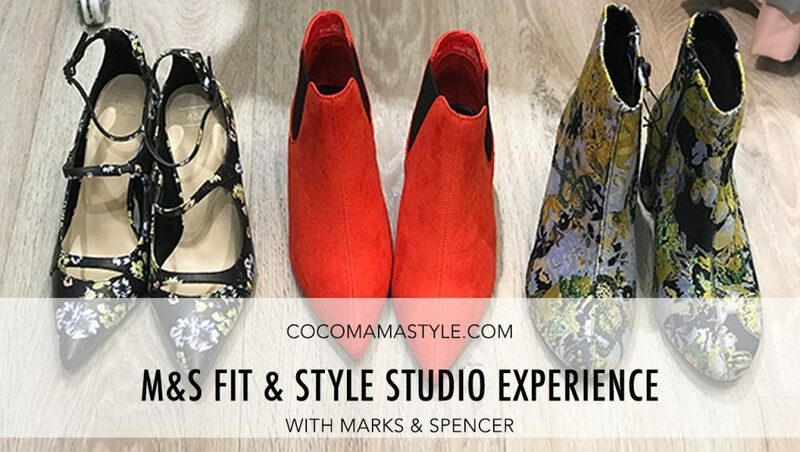 Whether you’re stuck in a style rut or lost your way with clothes after having babies, perhaps you need an outfit for a special occasion, long for a wardrobe update or simply want an efficient and successful shopping trip in one hour, booking with an in-store stylist will solve your style dramas. 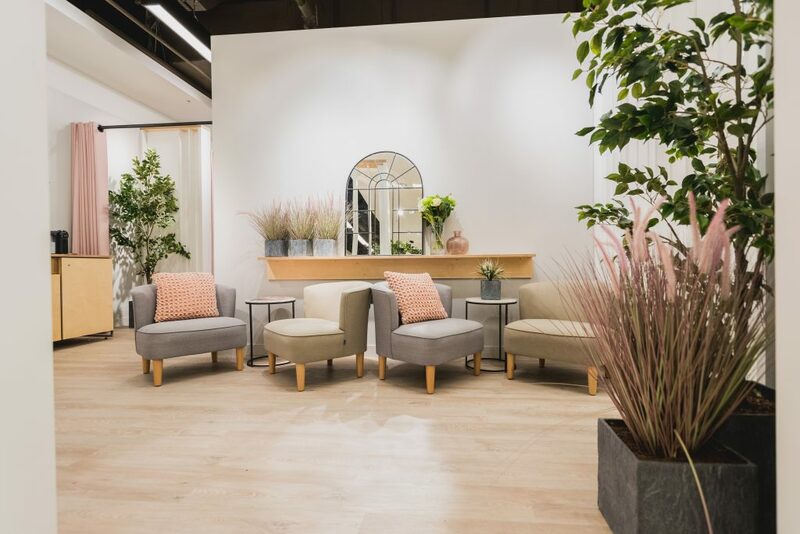 It’s free, relaxed and fun and your stylist will help you find the right outfits for your body shape and lifestyle so you go home with pieces you’ll wear and love. Sponsored by M&S. All words, opinion and experience my own. Huge thanks to my fab stylist Kristy.